10 Park & Ride lots located in rural parts of the city have morning and afternoon bus service to downtown on OC Transpo rural routes. 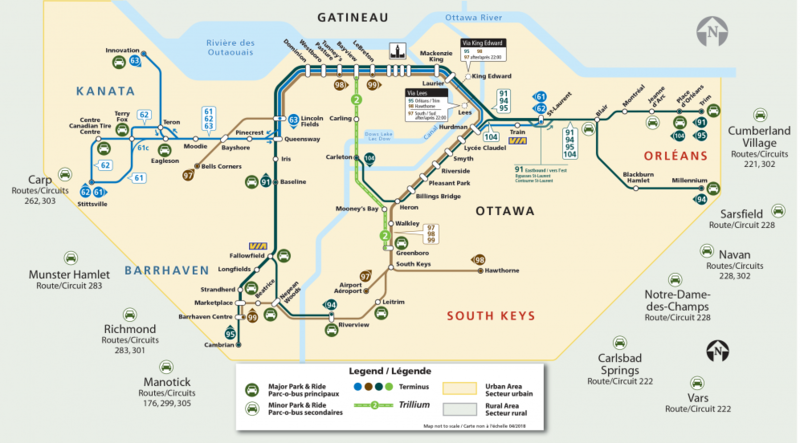 The rural Park & Ride lots are located in the following communities: Cumberland, Navan, Notre-dames-des-champs, Sarsfield, Vars, Carlsbad Springs, Manotick, Munster, Richmond and Carp Rd. Located at R.J Kennedy / Cumberland Community Centre, 1115 Dunning. Call 613-560-1000 plus 1458 up to 6 days in advance or text 560560 plus 1458 to hear the next departure times. Located at the Notre-Dame-des-Champs Community Centre at 3659 Navan Road. Call 613-560-1000 plus 2260 up to 6 days in advance or text 560560 plus 2260 to hear the next departure times. Located at the Sarsfield Community Centre, 3585 Sarsfield Road. Call 613-560-1000 plus 3721 up to 6 days in advance or text 560560 plus 3721 to hear the next departure times. Located at the Navan Arena. Travellers can park at the north side of the lot closest to Colonial Road. Call 613-560-1000 plus 2287 up to 6 days in advance or text 560560 plus 2287 to hear the next departure times. Located at Russell Township carpool lot east, off Rockdale, south of Hwy 417. Call 613-560-1000 plus 3532 up to 6 days in advance or text 560560 plus 3532 to hear the next departure times. Located at the Carlsbad Springs Community Centre at 6020 Eighth Line Rd. Call 613-560-1000 plus 1079 up to 6 days in advance or text 560560 plus 1079 to hear the next departure times. NOTE: You must park only in the designated Park & Ride area at the rear of the parking lot as indicated by the signage at the lot. Parking is not allowed beside the Community Centre, as these spaces are reserved for the centre’s clients. Located at the Manotick Arena. Call 613-560-1000 plus 1496 up to 6 days in advance or text 560560 plus 1496 to hear the next departure times. Located at the Munster Community Park (north lot), 2890 Munster Road. Call 613-560-1000 plus 2241 up to 6 days in advance or text 560560 plus 2241 for next departure times. Located at the Richmond carpool lot - 6179 Perth St. Call 613-560-1000 plus 3200 up to 6 days in advance or text 560560 plus 3200 for next departure times.